Chihuahua (pop. 841,000 in 1953; 3,241,000 in 2005), the largest of the 28 states in the Republic of Mexico, lies along the United States border facing the states of New Mexico and Texas, an arid, sandy plain extending 300-350 miles (500-550 km) inland from the Rio Grande River. Large stretches of the state have practically no rainfall. The elevated plateaus and valleys have a heavier rainfall but in most cases the total is less than twenty inches a year. Where irrigation is practiced the soil has been shown to be highly fertile. In the mid-20th century mining was the most important industry of the state, although stock raising was a close second. The state of Chihuahua along with the state of Durango originally formed the province of Nueva Viscaya. The principal (though not the largest) city is Chihuahua, the capital, with a population of 56,000 in 1950 (748,518 in 2005), located 227 miles (375 km) south of El Paso, Texas. The city and the state of Chihuahua are of special interest to the Mennonites because of the 15,000 Mennonites located 75 miles (125 km) west and north of the city of Chihuahua in 1950. The largest group were the Old Colony Mennonites settled in three distinct yet relatively adjacent areas. The separately organized settlements were known as the Manitoba, the Swift Current, and the Santa Clara settlements. The Old Colony population was something over 14,000 in 1950. The second largest group was the Sommerfelder Mennonites who numbered about 800. These two groups migrated to Mexico in the 1922-1927 period. The third largest group was the Kleine Gemeinde, which numbered about 700 and, along with the Sommerfelder and one settlement of Old Colonists, was located in the Santa Clara area. All three of the above-mentioned groups came originally from Manitoba. A fourth group, the Church of God in Christ, Mennonite, had a mission station adjacent to the large Manitoba Old Colony, numbering less than a hundred members. Its original members came from Oklahoma. The fifth group was the General Conference group located in the city of Cuauhtémoc which was composed of the remnant of about 50 refugee families who had escaped from Russia after World War I and temporarily settled in Mexico. Most of this group has since migrated to the United States and Canada. The General Conference group maintained a church and an evangelical witness in Cuauhtémoc in the 1950s. The Mennonite Central Committee carried on a service program in Mexico. In cooperation with the General Conference Mennonites, two schools were operated, one in Santa Clara and the other in Cuauhtémoc; a Mexican hospital was administered, clinical work was done in the colonies, and agricultural information was supplied to Mennonite farmers. During the severe drought years of the early fifties relief in the form of flour, seed oats, and funds to dig central irrigation wells were supplied. Of major significance for the state of Chihuahua is the large contribution that Mennonites have made to the development of agriculture. Dairy products, fresh and cured meats, and a number of cereal crops, chief of which is oats, have all been produced by Mennonites in large quantities. Before their settlement in the 1920s, there was practically no production of these commodities for commercial use, with the exception of the range cattle sent to northern markets. Fretz, J. Winfield. Mennonite Colonization in Mexico. Akron, PA: Mennonite Central Committee, 1945. Schmiedehaus, Walter. Ein feste Burg ist unser Gott: der Wanderweg eines christlichen Siedlervolkes. Cuauhtémoc: G. J. Rempel, 1948. Fretz, J. Winfield. "Chihuahua (Mexico)." Global Anabaptist Mennonite Encyclopedia Online. 1953. Web. 25 Apr 2019. http://gameo.org/index.php?title=Chihuahua_(Mexico)&oldid=91393. Fretz, J. Winfield. (1953). Chihuahua (Mexico). Global Anabaptist Mennonite Encyclopedia Online. 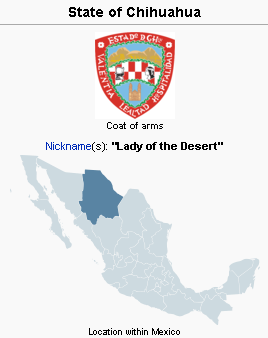 Retrieved 25 April 2019, from http://gameo.org/index.php?title=Chihuahua_(Mexico)&oldid=91393. Adapted by permission of Herald Press, Harrisonburg, Virginia, from Mennonite Encyclopedia, Vol. 1, p. 556. All rights reserved.